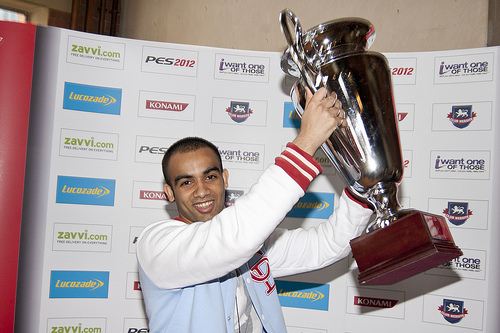 PESFan are offering all UK-based PES players a glorious chance to compete at one of the biggest PES 2012 tournaments in the world. With every new season on PES Rankings comes the opportunity for a chance to attend and play in the UK Main Event. Throughout the season players compete in events hosted on PES Rankings, from online tournaments to offline events such as the North vs South. With each event they earn points which count towards their overall position on the Rankings table and the top players at the end of the season go on to compete in the UK Main Event! Over the years we've given away some spectacular prizes for winning the Main Event including £1000 vouchers, signed merchandise and tickets to the World Finals which have been held in places such as Majorca and Germany! So, how can you make sure that you get a seat for the Main Event? As mentioned above, playing events and being in the top ranked list of players is one way but we're also running a competition for your chance to win a seat at this years Main Event. Entering is simple, just register on PESRankings.com, head on over to this page and hit the button 'Click To Enter'. Later on in the year we'll pick a winner at random from all the entries received, with the lucky winner receiving a guaranteed seat to compete at the Main Event. When we play-tested PES 2012 for the first time last July, the Main Event for PES 2011 was taking place in the background, and it looked like great fun. Seeing as it only takes a few clicks to enter, all of us at OPE HQ will definitely be entering. The opportunity to play against some of the best PES players in the country is a chance we simply cannot wave away. Going abroad and representing the UK at the PES World Finals wouldn't be too bad either! Good luck to all of you who enter.